What does surprise me is the number of children over six-years-old who come into the library and tell me that they are now reading chapter books, and their parents have asked them not to bring any more picture books home. Quite frankly, I’m tempted to jump right on the phone. Elementary age children are observant and receptive, and picture books offer them the perfect introduction to how stories work. Not to mention the fact that an increasing number of picture books are written for older readers. Graphic novels are picture books. Shaun Tan’s complex and beautiful picture books are perfect for adolescents. I sometimes see an older child looking at a book they enjoyed as a toddler, but they are now more able to see things they may have missed. 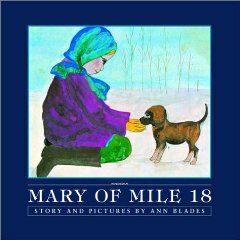 I often use picture books with middle school students to introduce a new concept or to show how a specific literary device works. We use picture books to talk about beginning, middle and end. We use picture books to introduce symbolism. When we begin The Outsiders by S.E. 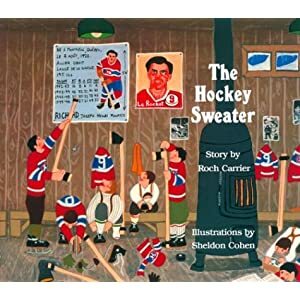 Hinton, I begin by reading The Hockey Sweater, the classic Canadian picture book by Roch Carrier. It sparks a wonderful discussion about identity and the need to belong – two of the themes in Hinton’s touchstone novel. Next week is Inly’s book fair, and I’m looking forward to sharing some new picture books with our students. One of them may find a story which will delight them now and comfort them the evening before their first standardized test. It may even inspire them to write some stories of their own! Inspired by last night’s Olympic Opening Ceremony, I pulled out the syllabus from the Canadian children’s literature course I took as a student at the Simmons Center for the Study of Children’s Literature. Before taking the course, my knowledge of Canadian children’s authors was not extensive. Of course, I had read L.M. Montgomery’s series about Anne Shirley’s adventures on Prince Edward Island and a few books by Tim Wynne-Jones, but that was about it. Reading the syllabus brought back memories of wonderful books by Canadians. Here are a few titles that really stood out for me.